TNCS Chinese Summer Camp: Promoting Healthy Lifestyles and Happy Campers! Over 2 weeks in July, The New Century School hosted a Mandarin Chinese Immersion summer camp that not only boosted participants’ language acquisition and speaking skills, but also emphasized the importance of physical health. Xie Laoshi (a.k.a., Jewel) believes that young learners will gain fluency faster when they are learning something new in a new language, rather than focusing just on the language itself. Thus, camp was built around a theme, and specific lessons in vocabulary and grammar related to that theme. Students are truly immersed in the language, but the point is that, through the proven six-pronged approach, they develop the confidence to communicate—to start talking . . . and reading and writing, too! Jewel also employs the 5 Cs of language acquisition developed by the American Council on the Teaching of Foreign Languages (ACTFL) that TNCS has been using all along in its multilingual language program curriculum. Communication, Culture, Connections, Comparisons, and Communities inform every language-learning activity the day holds. The most effective language program designs activities in which these five concepts intersect, which is exactly what Chinese Immersion Camp achieves, as photos throughout this post eloquently demonstrate. Ailing Lulu visits the doctor and is told in not uncertain terms to stop eating so much junk food! For Week 1, Xie Laoshi, Li Laoshi, and TNCS interns Ariel and Mary (who had just joined the staff), started by introducing the concept of a sick panda named Lulu. Within this beginning scenario, opportunities to speak to one another and to the teachers abounded. Why is poor Lulu not feeling well? Isn’t Lulu cute? What do pandas eat? Students at both novice and intermediate levels quickly acquired the words they needed to discuss this compelling situation—who doesn’t love pandas? Camp wasn’t all vocabulary by any means, however. Attendees learned by doing—another TNCS Chinese program tenet—and made arts and crafts, cooked and ate dumplings by the dozens, and sang Chinese songs. Plenty of movement and physical activity also took place each day. The week culminated with the performance of a short play. Each student was part of a four-person troupe, and each troupe acted out one of two level-appropriate vignettes involving either a short sing-song message or a scripted visit to the doctor. And that was just Week 1! In Week 2, students extrapolated what they learned about health from Lulu the panda to apply it themselves. The first half of the week brought more arts and crafts, interacting in the target language, and having lots and lots of fun. Jewel was extremely pleased with her students’ progress after just a week. “I am very happy with how the students are talking,” she said, “and they are very happy, too. They told me they don’t want it to end!” She says that she wanted to make sure they remember camp fondly and so planned both a field trip and an end-of-camp party for Week 2. On Wednesday, campers set out for Rockville, MD to visit the Washington Cathay Future Center, “an educational enrichment center [whose] aim is to cultivate students’ artistic expression, intellectual development, and leadership potential” all against the backdrop of Chinese culture. There, they painted kites using traditional materials and techniques (and were given the gear they needed to get it aloft to take home), ate authentic Chinese food, watched traditional dance, and participated in some t’ai chi. They had a fantastic time, needless to say, even before they received take-home gifts of tapestry necklaces depicting one of the 12 animals from the Chinese zodiac. Their last-day party was also an occasion to be remembered. Campers gobbled up homemade barbecued pork and red bean paste steamed buns (fashioned into porcupines! So cute! ); vegetarian and chicken mini dumplings; crispy shrimp snacks and snack cakes from China; and fresh, local watermelon. This cultural feast did not end with food, however. Students also performed “Xiong Mao Mimi,” a song about saving pandas by making sure bamboo is plentiful. Finally, they watched Kung Fu Panda 3—in Chinese! If you notice a bump in your child’s Mandarin skills over the next few weeks, you have the rich cultural experience of TNCS Chinese Immersion Camp to thank. If you notice a simultaneous inverse decrease in his or her consumption of pizza, fries, and cotton candy, you can give a similar shout out to Lulu the panda. 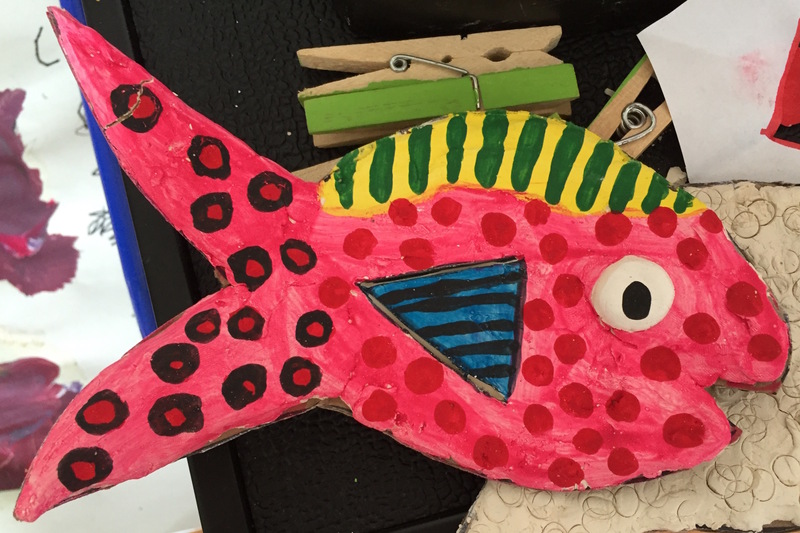 Summer sessions at The New Century School continue with an exciting block of camps hosted by The Painting Workshop. Led by TNCS art teacher Elisabeth Willis, art camp gives kids the chance to learn new techniques and try out new media while tapping into and expressing their creativity. 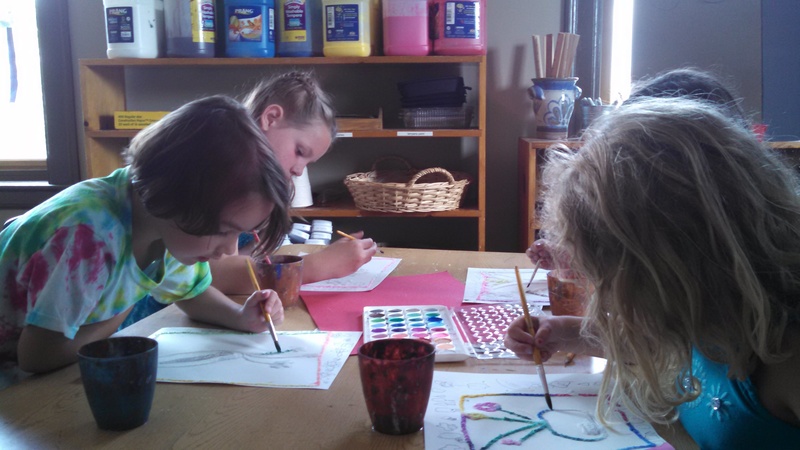 Each day, they work on one painting/project as well as get lots of free-drawing time and afternoon crafts. Their sole job is to make art, and they really give themselves over to the process. As the artist-campers experiment with colors, patterns, and brush maneuvers to their hearts’ content, Ms. Willis moves through the classroom, responding to questions and comments. “What do yellow and orange make? What about blue and pink and white?” they might ask. “Why don’t you try it out?” is the unfailingly encouraging response. This camp emphasizes exploration and the freedom to self-express and get creative . . . and even a little messy sometimes! Despite all the “self-expression,” going on, the atmosphere is calm and productive. Spills and accidents are handled without fuss, and the kids are gently reminded to keep working until they finish. Ms. Willis is no stranger to the art classroom and brings an impressive amount of experience to her role. She has both a Bachelors of Fine Arts in Art History and a Masters in Art and Teaching from Maryland Institute College of Arts (MICA). She freelanced after graduating in 2011 to spend time on her art, has spent several years with The Painting Workshop, and took over as TNCS art teacher this year. The day starts out with free draw (and each child gets a folder to collect their drawings to bring home at week’s end). About midmorning when everyone has gotten the wiggles (and the squiggles) out, they move on to the main project of the day. Ms. Willis gives step-by-step instructions and demonstrations, and campers get to it. One day recently, for example, Ms. Willis was exploring habitats in three dimensions. she sketched out a model on the whiteboard and then demonstrated how to model a figure (e.g., animal, alien, made-up creature, person) in clay (neon hued, naturally. The next task was to build a habitat for the figure out of paper, felt, pipe cleaners, beads, etc. ; their challenge was to give the structure height. Each camper met the challenge but their habitats share almost nothing else in common! Hard at work, painting away. Each week features a different theme to spark kids’ imaginations and get the creative juices flowing. Week 1 (June 20–24): Art and Nature The outside world comes alive in this camp where we are inspired by nature. From leaf rubbings and clay pressings, to plein-air painting, and sponge paintings of trees, we celebrate nature through our art! Week 2 (June 27–July 1): Art and Science Environmental science, chemistry, geology and geography can all be accessed through art. Whether we are making casts of dinosaur bones, or combining various ingredients to make lava for a volcano or to create the best goo, the most pliable clay, or a resistant glue, science is present, and art is the result. We’ll have lots of fun projects, experiments, and fun in this week of camp! Week 3 (July 5–July 8): Modern Art and You Join us as we explore the world of modern art. From Andy Warhol’s soup cans to Robert Rauschenberg’s constructions, Jackson Pollack’s drip paintings to Barbara Hepworth’s sculpture, we will take a look at their techniques and ideas to inspire our own. 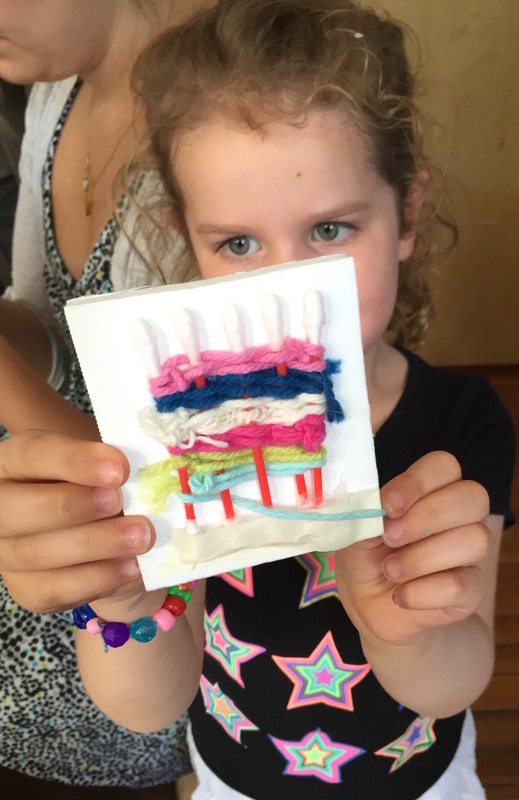 Abstract art, conceptual art, collage, sculpture, multi-media, drawing, and painting are all covered in this fun and inspiring class. Week 4 (July 11–15): Art Around the World Let’s take a trip around the world, exploring art as we go. Stop in Australia and discover aboriginal art. Create your own ancient Greek vase. Explore the calligraphy and printmaking of Japan, the Batik textiles of Indonesia, the landscapes of France and Italy. Art and culture—around the world! Week 5 (July 18–22): Under the Sea Water covers more than two thirds of our planet. Within it, we find amphibious life of all description and fauna and flora that exist only in the mysterious world of the sea. This camp celebrates the waters of planet Earth through painting, drawings, sculpture, and—of course—the use of water in art projects! The geology of the ocean, the uses of the ocean, the wonder of the sea—it’s a watery week of imaginative fun! Week 6 (July 25–29): Creatures Great and Small The world of animals, insects, and birds is magical and inspiring. Join us as we use art to both represent and interpret the animal world. From basic paintings of dogs and cats, to sock monkey puppets, to animal habitats (think jungles and the sea! ), we will explore the lively and mysterious world of the creatures that share our planet. Camp may include a visit from a friendly canine, or a lesson from Brittany Roger of The Drawing Zoo, who brings reptiles to drawing classes! Join us for this lively and entertaining week! Week 7 (August 1–5): Let’s Build! Sculpture Camp This sculpture class incorporates not just clay, but also wood, paper, plaster, and more. Students learn how to build armatures, so that their creations are strong and sturdy, and how to add the finishing touches with paint. We might build something realistic—a rocket ship, a house, an animal—or it could be something abstract such as a beautiful assemblage of colors and shapes. Stretch your imagination and your skills in this fun class! Week 8 (August 8–12): Art and Stories What are the stories we tell about our paintings? What are the paintings we create from stories? Older campers will write their own stories and poems, while younger ones can create a backdrop to stories told to them, read to them, or created out of their imagination. We will explore graphic design, illustration, painting, drawing, printmaking, and collage. There will even be a visit from a professional storyteller! Join us for a fun and creative week of words, stories, tall tales, and art! Week 9 (August 15–19): Space Camp What do we see when we look into outer space? Stars, comets, planets, and aliens! Beautiful constellations, fascinating planet mobiles, our own spaceships—anything is possible in this fun week of space exploration! Would you like to register your child(ren) in this engaging and creative camp? Please go here. This week at The New Century School, elementary-age summer campers have been locked in . . . or, rather, they have been locking in LEGO® bricks at Bricks4Kids Camp! This enterprise provides hands-on, multi-sensory classes for kids to play and build with LEGOs®. While they immerse themselves in imaginative creation, they also learn STEM (science, technology, engineering and mathematics) fundamentals by working with models created by engineers and architects. TNCS’s LEGO camp is run by Michele Rigatuso, who is not only the camp instructor but also a big fan.”I couldn’t be happier doing this camp,” she said. “I love hanging out with kids and teaching them, but working with LEGOs allows me to take a step back and let them learn by exploring.” She explained that the kids are learning with everything they are doing—architecture as they build, math as they count pieces and pegs for accurate placement, engineering as they introduce function to a structure. “Technic” bricks bring even another layer of complexity. This line by LEGO allows kids to create more advanced models (such as with movable parts, motors, wheels, gears, pins, and axles) and even machines in addition manipulating the traditional interconnecting plastic LEGO bricks. Pocket Brick Monsters: Get ready for an adventure in the world of Pokémon®! Capture wild Pokémon® creatures and train them for battle. Improve your accuracy and power as you learn new moves and use special abilities. Tap into your inner engineer as we build Dratini, Pikachu, Poké Balls, and more. Bring your own Pokémon® trading cards if you wish to play and trade at the end of each day. Show off your skills as you battle for power in your journey through the Pokémon® universe. Do you have what it takes to become a Pokémon® Master? Mining and Crafting 1: Experience the world of Minecraft with LEGO® bricks in this fun summer camp! Minecraft is a game about placing blocks to build anything you can imagine. At night, monsters come out, so make sure to build a shelter before that happens. Kids will start by crafting their shelters and some of the mobs, critters, and tools using LEGO® bricks then face new crafting key elements from the popular Minecraft game. Space Adventures: Inspired by NASA and Star Wars™, our Space Adventures Camp is packed full of models that will make your imagination blast off! Each day, campers will learn about real-life space exploration and build models related to the NASA space program. In addition, the day includes LEGO Star Wars™ themed models, video games, group games, challenges and more. Bricks 4 Kidz Space Adventure camp provides the spark for imagination and creativity to take off on an adventure that’s out of this world! Jurassic Brick Land: Are you ready for the adventure of a lifetime? Put on your hiking boots and camouflage…you’re about to enter Jurassic Brick Land! Campers will build a world that comes to life with gentle Brontosaurus, ferocious Velociraptor, terrifying T. Rex, and more. We’ll learn about amazing dinosaurs that lived during the Jurassic period and other extinct, prehistoric animals that roamed the earth and swam the seas during that era and millions of years later. Show us your building skills using our specialized project kits! Come learn, build and play at Jurassic Brick Land camp! Each session additionally is structured as a set of five stations that teams of four—Team Steve, Team Pig, Team TNT, and Team Creeper—rotate through: building models with standard bricks, building models with technic bricks, free build with standard bricks, making take-home designs with perler beads and paper folding, and iPad game time (e.g., Minecraft—see why that’s actually an added educational bonus here!). Recreating two-dimensional models in three dimensions! No matter what a child’s skill level is, he or she can always find something to build and be proud of at LEGO camp! I made a very cool chicken! Collaboration! Zombie creeper pig meets . . . a house? A car? Tree? TNCS Spanish Immersion Camp Gets Kids Hablar*! Talking, that is—and cantar (singing) and dancing (bailar) and playing lots of fun games (disfrutar un montón de divertidos juegos)! 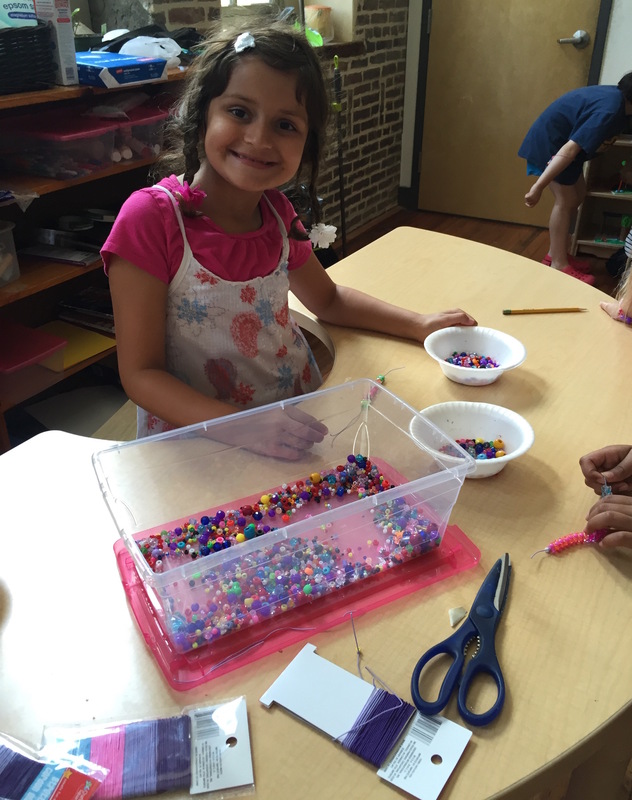 Amidst a classroom fairly jumping with color, motion, and Spanish words everywhere, kids attending Spanish summer camp at The New Century School se la pasaron de maravilla (had a blast)! Their parents probably noticed a very palpable increase in the kids’ pronunciation, willingness to use the language, and confidence in speaking it. She does not exaggerate. As bursting with energy herself as any 6- to 10-year-old, she made sure her campers didn’t have time to feel bored or restless—let alone to realize how much español they were steadily absorbing! In addition to practice with conversation and with learning popular Spanish songs, campers played “Simón Dice,” life-sized Ludo, and “Freeze Dance,” all of which demanded that they understand commands given in Spanish. Freeze dance, in particular, got downright competitive as the game grew increasingly complex, requiring the kids to not only understand the language, but to be able to think and strategize in it! Sra. Sanzana even tested their willpower to stay with the game while having the already-out players tempt them with snacks. They hung tough even in the face of raisins and goldfish crackers! Whether strumming her guitar or waltzing with campers, Sra. 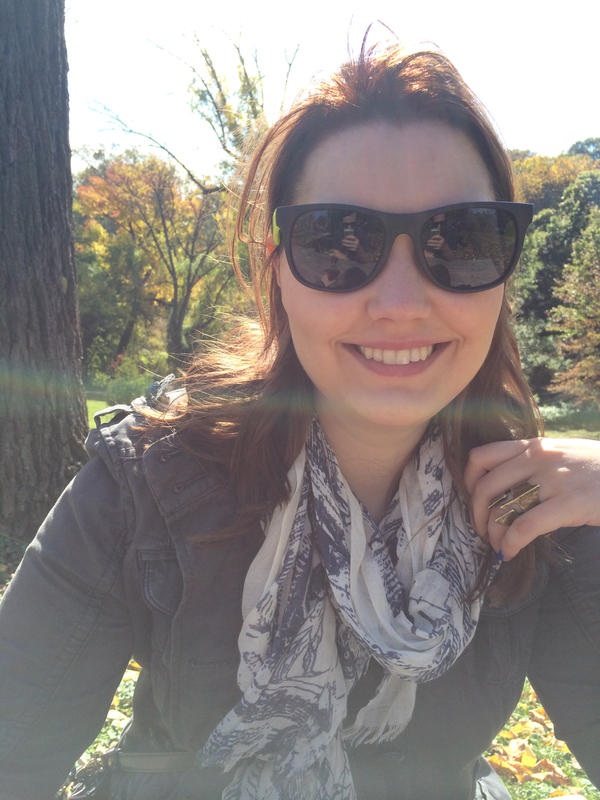 Sanzana made sure her students learned by doing, the most effective way to learn a language. Gracias el campamento de inmersión de español en TNCS! *Immersed would like to thank former TNCS Pre-primary Spanish Immersion Lead Teacher Raquel Alvarez for translation assistance :)!